Company Theatre is a community-run theatre organisation, based in The Rose Centre, Auckland, New Zealand. We hereby give notice to our financial members that the Company Theatre AGM will be at The Rose Centre, in the theatre, at 7.30pm on Monday 10th March. We extend a warm invite to any of the Friends of Company Theatre, receiving this newsletter, who would like to attend and hear a bit more about the running of the theatre. The meeting should take about half an hour and then please join us for drinks, nibbles, and a farewell toast to one of our longest standing members, Richard Parmee. See Below for more details. There is room on the committee for NEW MEMBERS. You need to be a Financial Member of Company Theatre ($10) which can be paid on the night. Nomination forms will also be available. You need a proposer and a seconder from financial members, for nomination to our committee positions but membership is open to all. We will be proposing a new Membership Fee at the AGM. The motion reads: From 2014, Membership of Company Theatre is free, but you need to register to be a Member either on the website (or on a form available from the Secretary) to participate in the society's activities. We see this motion as a thank you to our fantastic volunteers who give their time to Company Theatre whether on stage, back stage or with our Front of House teams. We still value the idea of membership and we need to have an official membership list to meet the criteria for being an Incorporated Society, so unfortunately form filling/registration cannot be avoided! Otherwise, just continue to be a Friend of Company Theatre through our free email list. After the AGM you are welcome to view the new Company Theatre Rehearsal room and the progress we have made. The official opening for this space and acknowledgement to the generous people who have helped support this project, will be in another month or so. We are still waiting for the final building consents to be approved by Council. Richard's fabulous, almost 20 years, with Company! Many of you will have already heard the news that long time Company Member Richard Parmee is leaving Auckland to live up North. Richard has acted in 25 productions during his almost 20 year association with Company, and has participated in all areas of the society. Although his final departure date is not yet set, we will be acknowledging his fantastic contribution to Company Theatre at this, his final AGM. Anyone who has known Richard at Company Theatre is welcome! Please just come along, or RSVP to sherryede@hotmail.com as we will organise some tasty nibbles and supper. Our first production for 2014, directed by Steven Arnold, is in full rehearsal. FUNDRAISING NIGHTS for your group. Bookings are now being taken - either for individuals, or for those interested in booking half a house or a whole house and raise money for their organisation at the same time. For details of how our fundraising works, see the website page on FUNDRAISING. If you would like some flyers sent to you, please email Richard info@rosecentre.co.nz with your postal address. Set in London, in 1895, the play opens during a dinner party at the home of Sir Robert Chiltern in London's fashionable Grosvenor Square. Sir Robert, a prestigious member of the House of Commons, and his wife, Lady Chiltern, are hosting a gathering that includes his sister Mabel Chiltern, his friend Lord Goring - a dandified bachelor and close friend to the Chilterns - and other genteel guests. The story revolves around blackmail and political corruption at the end of the 20th Century but its themes are relevant today. 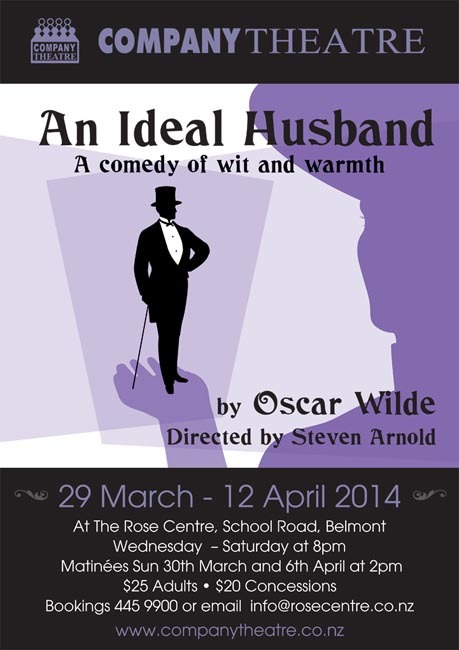 If you enjoyed Oscar Wilde’s "The Importance of Being Earnest”, you will like this as well. The dialogue is fast and witty. Oscar Wilde’s own comment on this play was - that sooner or later, we shall have to pay for what we do, but no one should be entirely judged by their past. The costumes, the lighting and very modern set design will add to your enjoyment. Any group over 20 will receive a discount. See FUNDRAISING or BOOKINGS on the website. Phone Richard on 445.9900. If you would like to be on the roster for helping on the bar OR as an usher OR a programme seller for this show, please email now to sherryede@hotmail.com. Even if you have emailed before for other shows, please email again, as it's true that people's circumstances change and you are not always available for every show. Please email the days you are available and the job you prefer. The dates of this production are March 29 - April 12. The days are Wed - Sat for 8pm shows, both Sundays for 2pm shows. No show on Monday or Tuesday. The Volunteers Meet, Greet and Wine Evening, combined with the viewing of the final dress rehearsal will be Wednesday 27th March. Please let Sherry know if you are coming that night as well. We really look forward to seeing you. It's a great pleasure to see our volunteers and back stage crews enjoying a glass of wine, just before opening night.